Summer is in full swing in Fair Play. Wineries have scheduled regular events through the summer, ranging from music to barbeques to concert events. To mention just a couple of things going on: Always fun are the every-other-week jazz sessions at Mastroserio Winery. Ruggero and his group play great music. You bring a picnic and enjoy the late afternoon-early evening ambiance. Saluti Cellars Winery hosts Smokin’ Saturdays each Saturday evening, with music and food for purchase. And, the ever-popular SlugFest is scheduled for August 2 & 3. Bring your own glass, park at dkcellars and ride the Short Bus Shuttle between dkcellars, Colibri Ridge Winery and Oakstone to taste great wine. There is no charge for this event and it is great fun. So, come out to Fair Play and enjoy these fun happenings. Stay at Lucinda’s (book it now) and enjoy a great weekend. I am always looking for new recipes to add to our repertoire at Lucinda’s. Recently I tried a great gluten-free muffin recipe. I found it in a cookbook that I use all the time — “The Big Book of Baking” by Carla Bardi. The book title for the recipe is “Gluten-free muffins”; not very enticing. 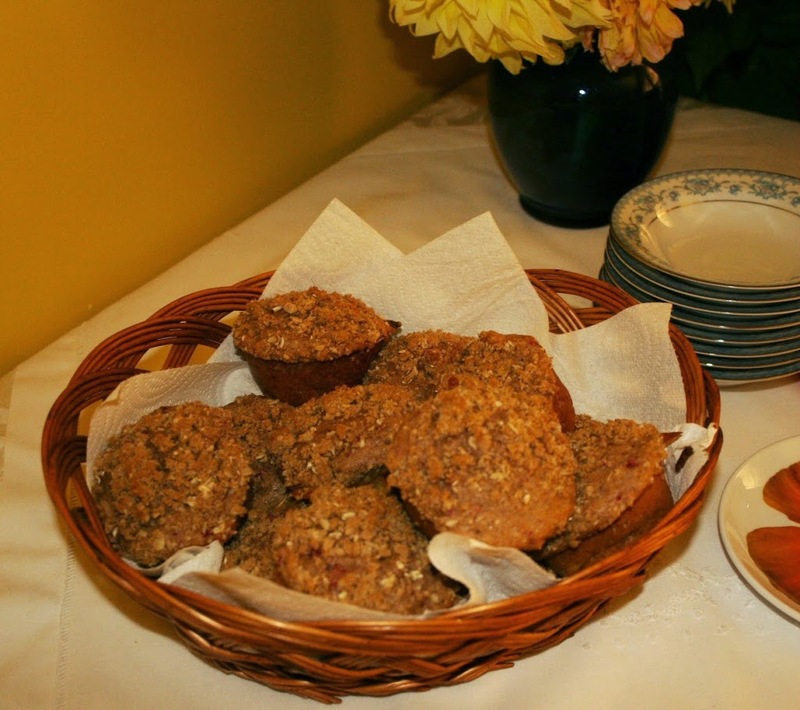 I have changed the name to “Banana Apricot Muffins”. This is a delicious muffin for everyone. I hope you like it. Preheat oven to 375. Line a 12 space muffin pan with muffin cup liners. (I always use muffin cup liners with gluten-free muffin recipes. Spraying the pan does not prevent sticking.) Stir together flour, bran, baking powder, ginger, nutmeg and salt in a large bowl. Beat the egg, brown sugar and oil in a bowl. Mash the bananas and combine with the milk, apricots and raisins and add to the egg mixture. Add the dry ingredients and stir gently. Fill the muffin cups 3/4 full. Bake for 20-25 minutes. Cool slightly before serving.